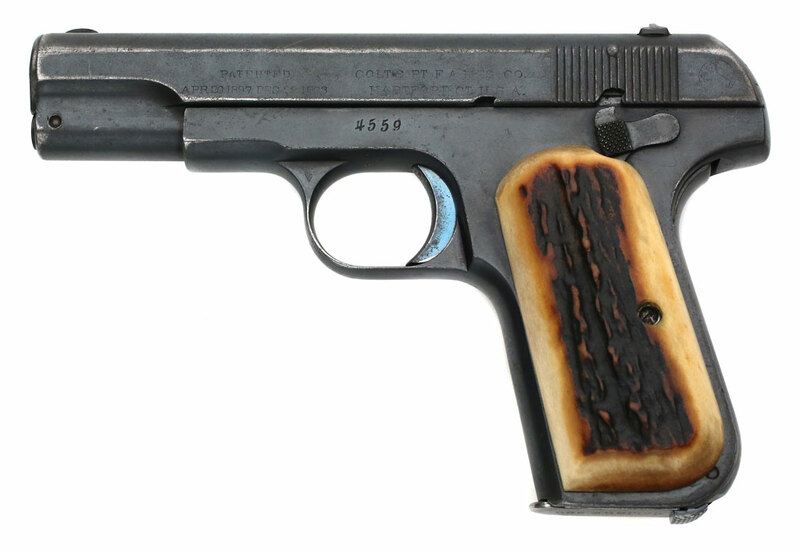 Colt 1908 Pocket Hammerless .380 ACP serial number 4559 factory inscribed "C.P.D. No. 6" on grip safety. This was one of 20 guns marked "C.P.D. No. 1-20" on the grip safety shipped to the Chicopee, Massachusetts Police Department. 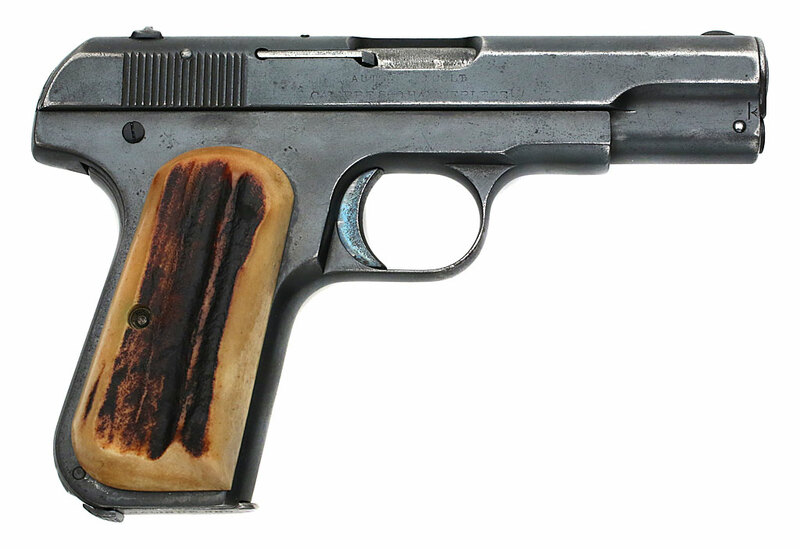 Colt 1908 Pocket Hammerless .380 ACP serial number 4559 factory inscribed "C.P.D. No. 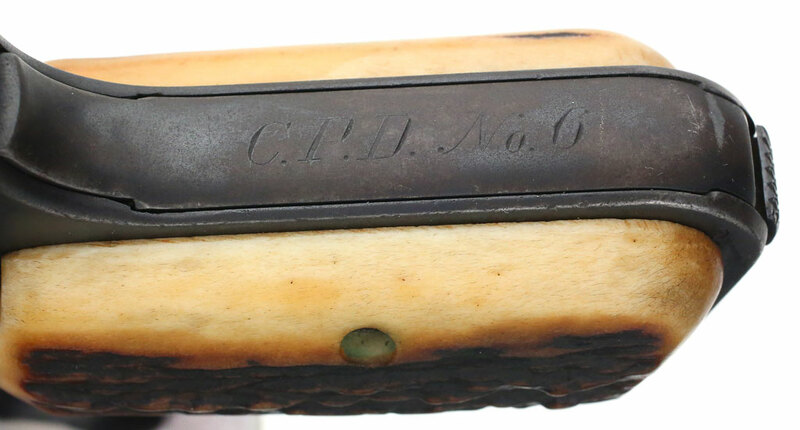 6" on grip safety - Pistols in the serial number range 4478 - 4560 with this marking were shipped on December 22, 1909. Serial number 4559 (pictured) is the consecutive serial number and the consecutive police number to serial number 4560, inscribed "C.P.D. No. 6" on grip safety (below). The stag stocks are aftermarket replacements. Colt 1908 Pocket Hammerless .380 ACP serial number 4559 factory inscribed "C.P.D. No. 6" on grip safety - right side. 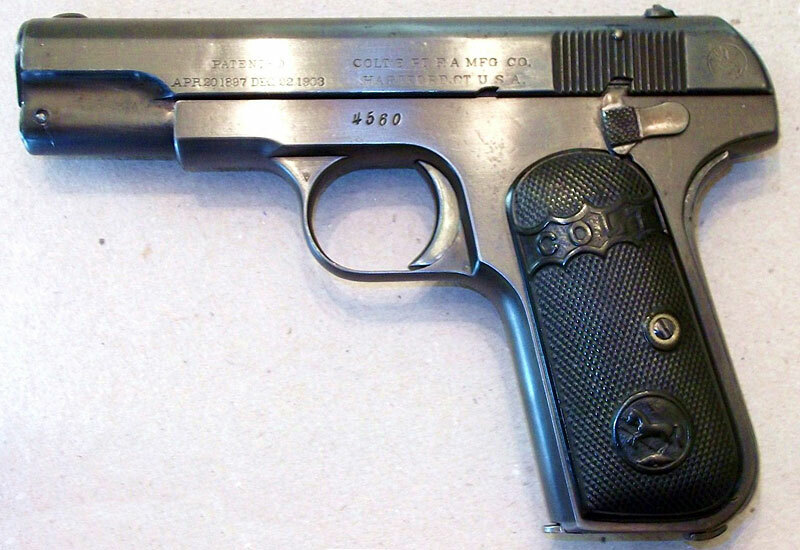 Colt 1908 Pocket Hammerless .380 ACP serial number 4559 factory inscribed "C.P.D. No. 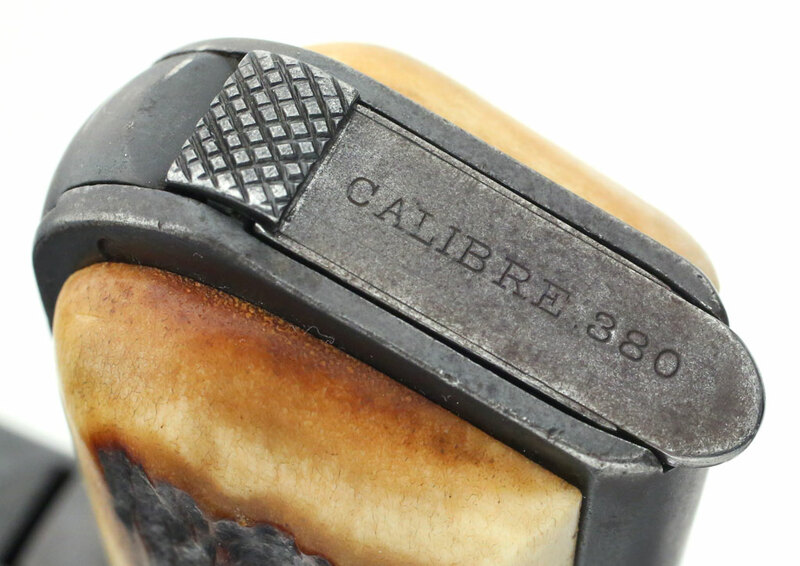 6" on grip safety - early pin base magazine with "CALIBRE .380" marking. Colt 1908 Pocket Hammerless .380 ACP serial number 4560 factory inscribed "C.P.D. No. 7" on grip safety. This was one of 20 guns marked "C.P.D. No. 1-20" on the grip safety shipped to the Chicopee, Massachusetts Police Department. Colt 1908 Pocket Hammerless .380 ACP serial number 4560 factory inscribed "C.P.D. No. 7" on grip safety - Pistols in the serial number range 4478 - 4560 with this marking were shipped on December 22, 1909. Serial number 4560 (pictured) is the high serial number in the shipment. 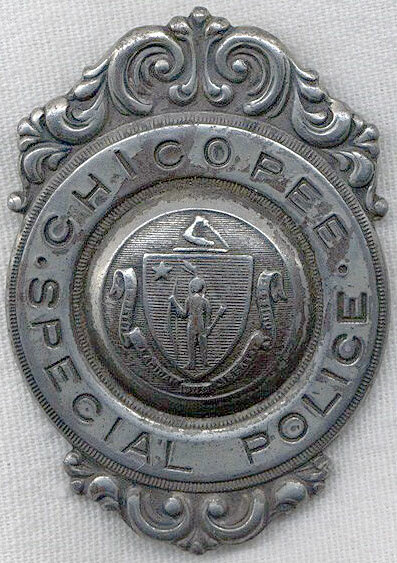 Original Chicopee Special Police Badge from the period. 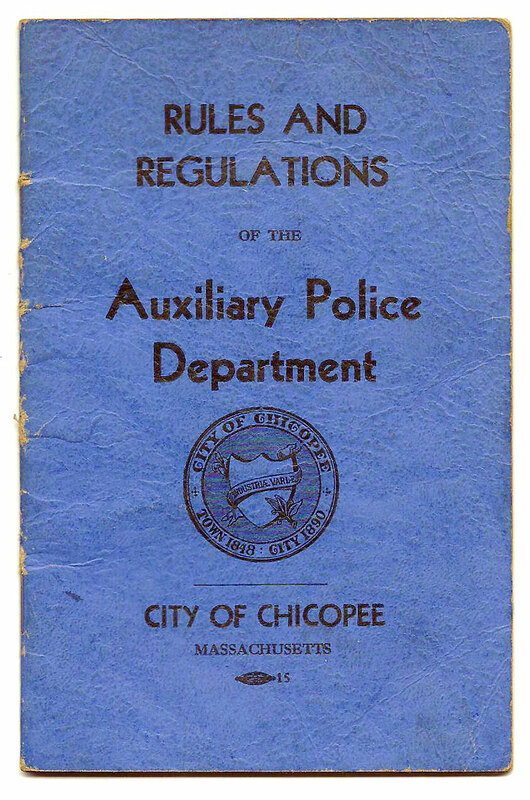 Rules and Regulations of the Auxiliary Police Department, City of Chicopee, Massachusetts.